For this recipe, everything is to taste, and the quantities can be easily adjusted. The only real variable is that you want the stock to be about 1/2 inch deep when you add it.... That being said, I have a nice 14 inch sauteuse, which holds a lot of chicken, thus the 3 birds. 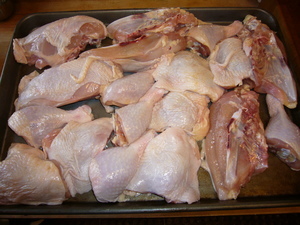 I cut them up, using only the leg, thigh, and breast. The backs and wings went into stock, but you can use them as well, your choice. Season the chicken with salt and pepper. Preheat the oven to about 300. Put your braising vessel on the heat and adjust heat to medium high. When hot, add the tablespoon of oil and spread around bottom of pan. Add a layer of chicken and brown well on first side. Do not crowd the chicken at this point as we want to let the steam escape. Do the chicken in batches if needed. I'm doing two batches. 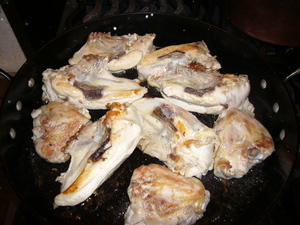 When well browned, turn chicken and brown other side. 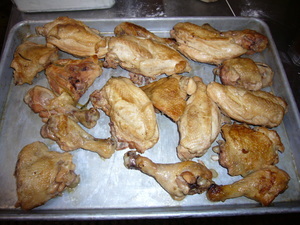 When well browned on both sides, remove chicken to a tray, and finish second batch if appropriate. 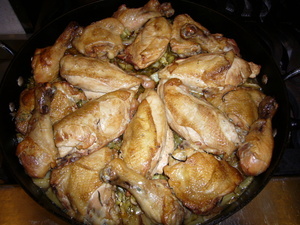 When the wine has reduced, add the chicken back in arranging for maximum capacity. I like to put the point of the breasts in the center of the pan, as they are the smallest part, in a star pattern. 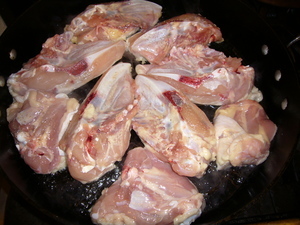 Then I can put a thigh between each breast, near the rim of the pan, and a leg at the base of the breast. 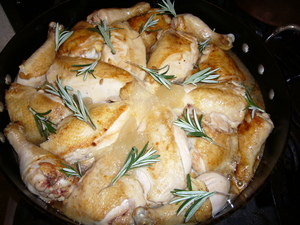 Break the rosemary into smaller stems, and arrange on the chicken. Use as much as you like, bearing in mind that fresh rosemary is more mild than dried. Add enough stock to be 1/2 inch deep. 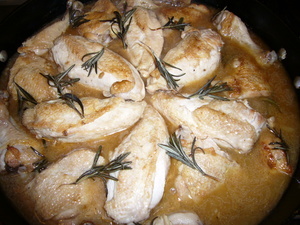 The tighter the chicken is packed into the pan, the less stock you'll need. The 3 cups is just a rough estimate. The depth is what is important. Cover, and place in the 300F oven. Back for about an hour and a half or till tender. When tender, you'll notice that the liquid in the pan is actually deeper. This is liquid given off by the chicken. 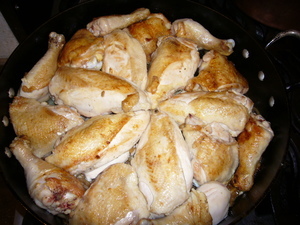 Remove the chicken to a tray, and strain the pan juices. 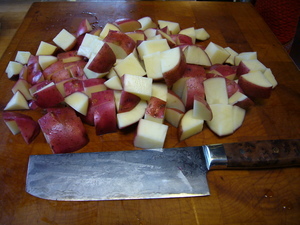 While the chicken braises, cut up the potatoes. Return the strained sauce to the pan (rinsed out to remove rosemary stems, etc. 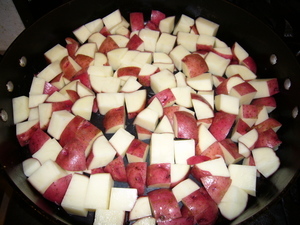 ), adjust the seasoning, and add the potatoes. They should be sufficient to fill the pan in one layer. 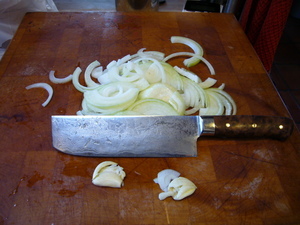 Top the potatoes with the celery, and sliced leek. 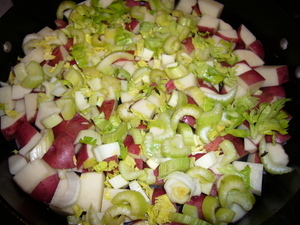 Return pan with the sauce, potatoes, and celery to the oven. When the potatoes are just near tender, arrange chicken on top of the potatoes, and return to the oven to re-heat the chicken. After about 15 minutes (or when chicken warmed through) remove and serve.